How to Explore the Port like a Local On Your Next Cruise Vacation! Exploring the exciting entertainment and sights of the Port Canaveral area is an experience of discovery. Your cruise ship may offer quick excursion packages, but these are only going to hit the touristy areas and leave many gems in their wake. Plus, now you’re on a schedule, and who wants that? Florida’s Space Coast is so varied with food, live music, and historic downtown areas that we think you’ll find an adventure on your own. Uber, ubiquitous in most cities by now, is probably the easiest, cheapest, and most available way of moving around for a day-long excursion. This is a great way to get to places that are a little extra distance from the actual port itself, such as scenic Cocoa Village and the Kennedy Space Center. Ship to Shore Fun is a local company for those with additional transportation needs. 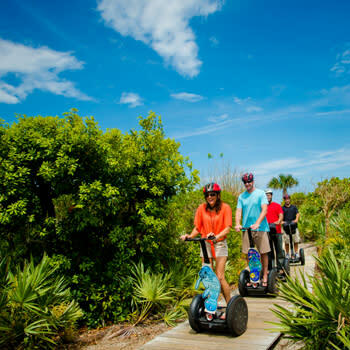 For those just looking to stay within the few square miles of the port (and there’s plenty to do and see just there), an engaging and unique way to get around includes Space Coast Segway Tours and Limo Cycle Tours. Reservations are recommended in both those cases. Two great places for this is the spiking architectural monument of Exploration Tower at Port Canaveral and Cocoa Village. Located just a short walk from where your ship will be, Exploration Tower offers some of the finest views of the surrounding area and the vast Atlantic Ocean. Open 10 a.m. to 5 p.m. and at a mere $6.50 entrance cost for adults, the exotic tower is a piece of art itself. It can be difficult to time correctly, but if you schedule ahead, get lucky (and make reservations), watching a rocket launch from Exploration Tower is easily the best view on Florida’s Space Coast. In Historic Cocoa Village, the mood is calmer but the views no less stunning. Walk along the edge of the Indian River Lagoon, and take the time to step into the small shops and pubs that make this place so endearing. Riverfront Park and Lee Wenner Park are both terrific places to relax with river views and playgrounds for the kids added on. Cocoa Village is one of the oldest places on Florida’s Space Coast, and most buildings have an interesting historic angle. Be sure to check out the 102-year old Porcher House behind Riverfront Park. If you’re looking for a little more action, the areas of Port Canaveral have you covered there, too. Legendary Cocoa Beach, a five-minute Uber ride from the mouth of the port, has everything from parasailing to surf lessons. And right next to the port, cool off inside at the Arcade at Jungle Village, or enjoy a pint at the expansive Florida Beer Company brewing facility. Rusty’s Seafood and Oyster Bar is a Space Coast institution and the perfect place to bring the whole family for a full-course seafood meal. They offer great mixed drinks (and souvenirs), and anything off the “Buried Treasures” portion of the menu will be top-notch. 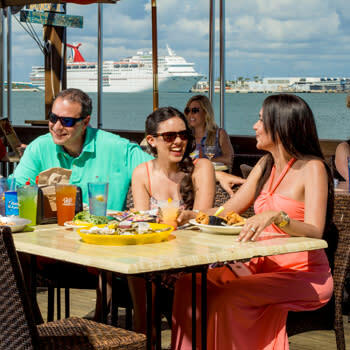 Grills Seafood Deck and Tiki Bar is similar to Rusty’s in look and feel, but open for breakfast, lunch, and dinner. Grills’ tiki bar stands out for its view, and the wine list isn’t lightweight. Try the lionfish; you’ll be helping the local environment and delighted by the taste at the same time. Fishlips Waterfront Grill is a party at night and a restaurant during the day. They have a great 3:00-6:00 pm Happy Hour and are known for their snow crab. If you happen to be visiting on a Sunday, do not miss their brunch. Baja Chowder and Seafood is owned and operated by a local fishing family and it shows: Baja’s seafood is otherworldly. With great weekly specials, such all-u-can eat, you absolutely cannot make a mistake when ordering here. Make sure to try the chowder, though. Now that is a full day around Port Canaveral on Florida’s Space Coast. Happy and exhausted worry not; your ship is right nearby in one of the busiest cruise ports in the world.